Create endless styles from effortless straightening to perfect curls or waves. STRAIGHT & CURL BRILLIANCE in ROSE GOLD is rated 4.6 out of 5 by 24. Rated 5 out of 5 by Nou13 from Great Value for Money I bought this straightener/curler a few weeks ago and there was a sale on it, it does the job perfectly whether straightening the hair in absolutely no time (just one swipe!) or curling due to its rounded design, it saves you from buying two tools! It makes a bit of a sound though because of the ionizer which is a bit disturbing, however, it has a disclaimer saying it may make sounds which made me a bit relieved when I first heard the sound! Overall my experience with this tool is impressive, I really do like it and it saved me a lot of time doing my hair, I absolutely love it! Rated 5 out of 5 by Lynda789 from Long cable, curl and straight which I love I recently purchased these to replace GHDs which I dropped in a bucket of water by mistake! I had Babyliss before my GHDs and loved them and was persuaded to get GHDs but i'm now back with Babyliss and my hair is smoother I find them much better for the frizz after blow drying. They curl well too. 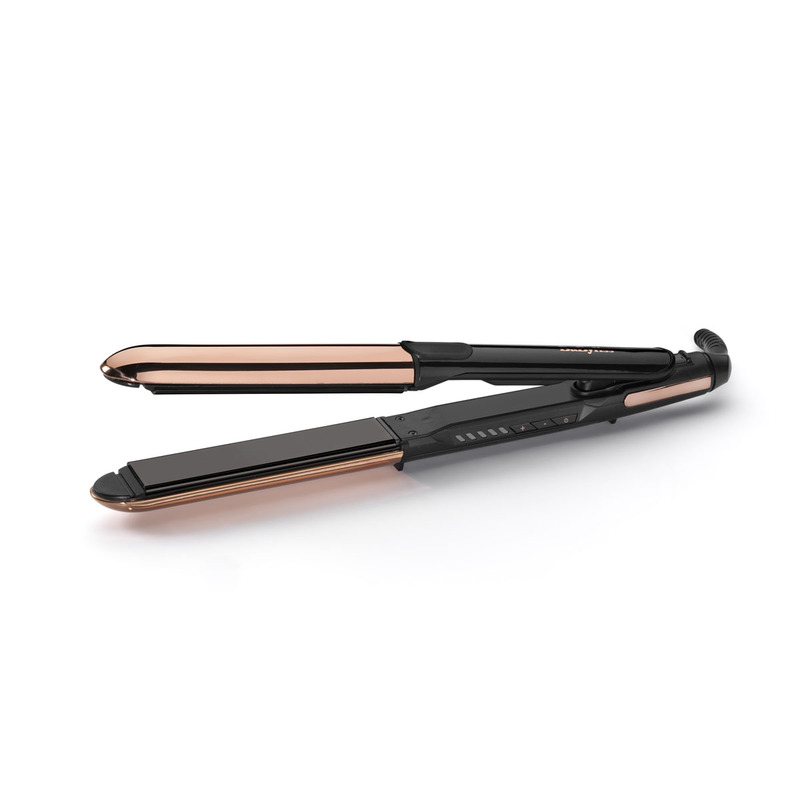 Rated 5 out of 5 by Zahra29 from Best straighteners! Bought this two weeks ago and by far it’s the best straightener I’ve used! I’ve had two ghds and the steam pod,but I’ve found these to give the best finish. My hair is thick and very long and I can straighten my whole head in five mins! Love that I can easily curl too if needed! Five stars! Rated 3 out of 5 by Cbux from Slightly disappointed Previously had Babyliss straighteners which were much cheaper ones, they did the job but were getting a bit worn out so was looking for a replacement. I saw these at half price, looked good and with the features I decided to buy them. Being much more expensive than I’d usually consider paying I had great expectations but unfortunately I was left disappointed. I felt that these were no better than my original Babyliss straighteners. The curling option which I really was keen to try I don’t think was suited to my shoulder length hair and wasn’t as easy as shown in the demo. For normal straightening I felt they did not glide through my hair as well as my originals. Maybe these straighteners are better suited for longer hair but when I need to replace in the future I think I’ll just stick to the cheaper, simpler designed straighteners and not be tempted by the looks! I would probably still buy Babyliss though. Rated 5 out of 5 by Lizzie from Brilliant I brought this so I could have a straightener and curler in one, I haven't used the curler yet but the straightener is very good, very easy to use and my hair stays all day. I have to use the highest heat setting which works well with my hair. Definatly recommend. Rated 5 out of 5 by Brigita from Grea straightener! The first thing which catched my eyes was the design. Nice, easy to handle. Heats very quickly, works well on my thick coarse hair. Rated 5 out of 5 by Argy from Pretty good This is my first straightener I have ever use.It is easy to handle it and it does really good job.Its value for money. I was afraid to use it in the beginning but after a few times i can say I am an expert! !